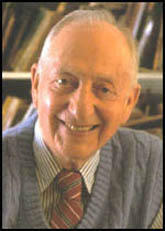 Herbert Block was born in 1909. Influenced by the work of Jay Darling and Edmund Duffy, the nineteen year old Block became staff cartoonist with the Chicago's Daily News in 1929. 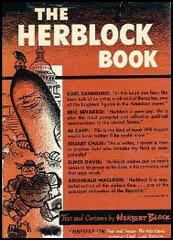 His cartoons, signed Herblock, initially reflected the right-wing views of the newspaper. However, the Great Depression radicalized Block and he became increasingly critical of the presidency of Herbert Hoover. In 1933 Block moved to the Newspaper Enterprise Association in Cleveland, the feature service that had been established by Edward Scripps. During the 1930s Block's cartoons highlighted the dangers of Adolf Hitler and the rise of fascism in Germany. He also attacked the America First Committee and its isolationist foreign policy. Block was a supporter of Franklin D. Roosevelt and the New Deal. He later commented: "I had started working before the Depression and was never out of a job. But an awful lot of people were, and this guy was doing something about it. It taught me that government can do the things that need to be done." 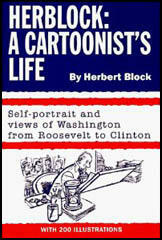 In 1942 Block won his first Pulitzer Prize for cartooning. Block joined the Washington Post in January, 1946. His cartoons were very popular with the public but upset his employer during the 1952 presidential campaign when his cartoons criticized Dwight D. Eisenhower. Worried about the influence he might be having on the public the cartoons were not published in the final days of the campaign. However, after complaints from readers the cartoons were reinstated. 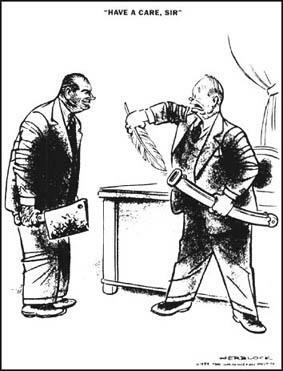 In the early 1950s he was one of the few cartoonists willing to take on Joseph McCarthy. Block was the first person to describe this crusade against people with left of centre political views as McCarthyism. McCarthy responded by calling the Washington Post as "the Washington edition of the Daily Worker". Whereas Ollie Harrington was forced into exile and Bill Mauldin into retirement, Block survived and went on to win his second Pulitzer Prize in 1954. Block was appalled when Richard Nixon was elected president. He often quoted the comments of Barry Goldwater who claimed that Nixon was "the most dishonest individual I ever met in my life". Block's views on Nixon were reflected in his cartoons and he played an important role in exposing the Watergate scandal. Block won a third Pulitzer Prize in 1979. For over sixty years Block produced drawings that expressed his liberal views on politics. This included attacks on racial discrimination and segregation. One friend, Ted Koppel, remarked that: "In person, Herb is the sweetest, gentlest man you could ever imagine. But put him behind a pen and something happens. His cartoons can be like a direct hit to the solar plexus." By the 1990s Block's cartoons were appearing in over 300 newspapers and magazines in the United States. Herbert Block died on 7th October 2001. (1) Herb Block was interviewed by Brian Lamb on 14th November, 1993. Brian Lamb: Who was Joe McCarthy? Herb Block: Who was he? He was the United States senator from Wisconsin and a man who, after he'd been in the Senate for a while, found that there was paydirt in pretending to find Communists in the government. He made a speech in Wheeling, West Virginia, I think in 1950, February, in which he said, "I think there were 205 Communists in the government," and he never showed people any list. Brian Lamb: Here's a cartoon from the year 1950 -- The headline on it is, "You mean I'm supposed to stand on that?" And right up here is the word "McCarthyism." Did you invent that? Herb Block: That's the first use of that word that I know of and I remember how it originated because I wanted to put something on that tar barrel and you couldn't call it McCarthy himself, and you wouldn't say McCarthy techniques or so on and I thought, "Well, maybe just use one word, McCarthyism," and, you know, it caught on. Brian Lamb: Did you ever think that McCarthyism, as you defined it, was a threat, a real threat to this country? Herb Block: Oh, yes. Certainly. God, it was a threat at the time. And it was a very real threat and there were people driven out of office, people whose careers were wrecked, there were people who commit suicide because of the attacks on them. Block's distinct point of view, given free rein by his paper, established him as a pull-no-punches cartoonist. He conveyed the public's fears of the atomic bomb through a menacing character called "Mr. Atom". He correctly saw the civil rights of the nation's black population as the next big agenda item. He even attacked the Daughters of the American Revolution for discrimination. 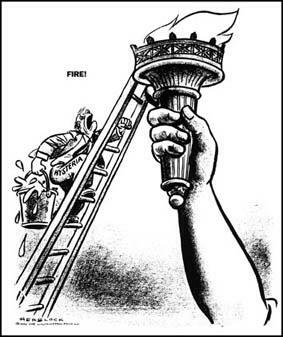 But Block was to show the courage of his convictions when he chose to confront an issue that many cartoonists - and their papers - gave a wide berth, by aiming his sights at the junior U.S. senator from Wisconsin, Joseph McCarthy. It has never been a cartoonist's job to be fair, and Herbert Block, who has died at the age of 91, saw no reason to discard that honourable tradition. He laid about the White House and the Congress with splendid glee and total impartiality. His disappearance, after an astonishing 74-year career, will let American politicians sleep secure in the knowledge that one of their greatest tormentors has gone to his reward.